This is a weeks long posting on Salsa Salads because we’re on VACATION! In other words – these posts are short on the blah de blah blah and loooong on flavor, color and fun! 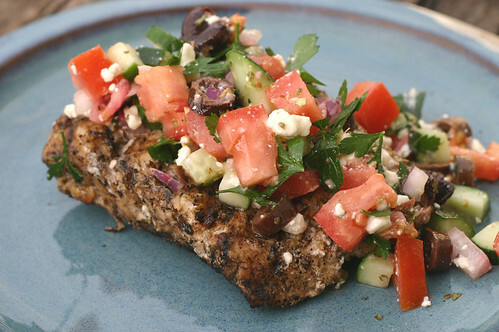 This Greek Salad combo has quietly crept into our summer program on about a bi-weekly basis. It crept in because if you serve it three different ways you don’t realize you’re having it quite so often. But even if you do realize it – it’s such a delightful little recipe that it just doesn’t even matter. 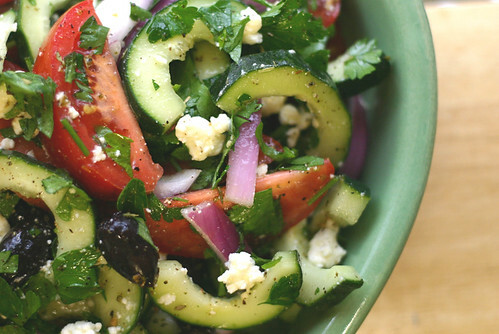 The top photo is the Greek Salad in large pieces – it makes a great side salad. 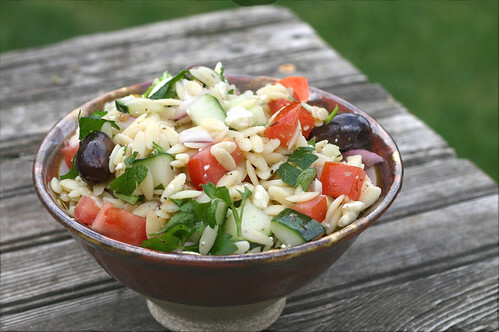 This second photo has all the Original Greek Salad’s ingredients chopped up small and mixed in with some orzo pasta. This style is great with grilled chicken for a nice lunch or dinner. The dressing works well for the chicken marinade too – just add 2 tsp basil and some minced garlic. This last photo has the Original Greek Salad’s ingredients all chopped up small and served over fish. Mix dressing with salad – serve slightly chilled. Just got back from my local farmers market where I stocked up on all the necessary ingredients for my favorite salad! I lived in Greece for 3 months when I was in college and literally lived off Souvlaki and greek salad every day. Whenever I try to make it for myself, I just can’t get the dressing quite right. Thanks for pointing me to the right acid! Can’t wait!